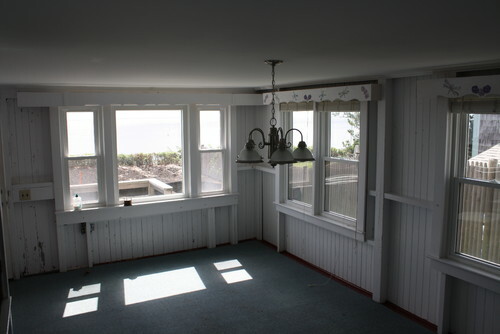 The cottage perched atop a bluff had seen more than 100 years of families roughing it every summer in the seaside "campgrounds" neighborhood of Harwich Port on Cape Cod. Indeed, these hastily constructed summer camps built at the turn of the last century defied the rules of engineering and common sense. How could they still be standing after more than a century of weather? 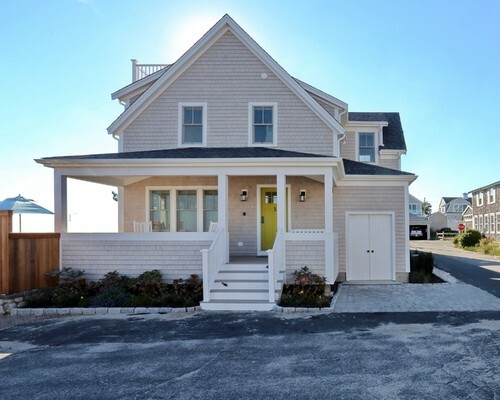 Last year the owners of an Atlantic Street property chose to tear the house down and start over, and the result is a refreshing change from the over-sized, out of proportion reconstruction taking place all over Cape Cod. Note the walls--solid wood with no insulation. Homes in the "campgrounds" were only used in July and August. 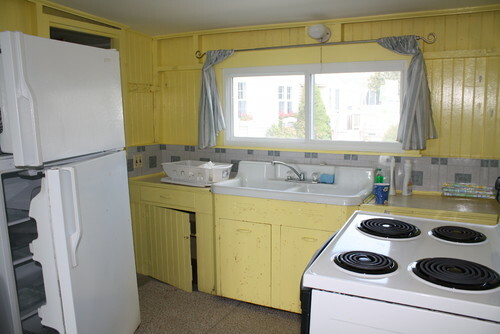 I hope they saved that amazing enameled sink for ebay. 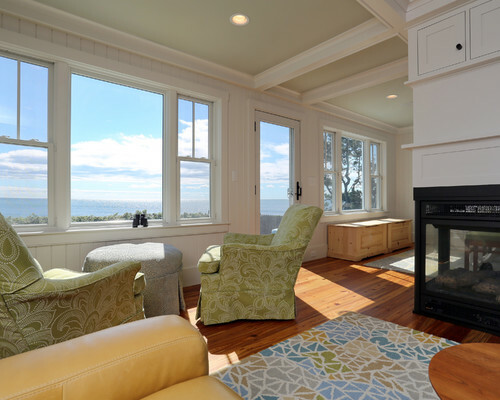 There's the ocean beyond, but you have to get past the funky wood valances and indoor-outdoor carpet to think of enjoying the view. Plus, on a perfectly sunny day, it's oddly dark in here. A tiny electric space heater at the floor removes the chill in the air, but can't be very safe. 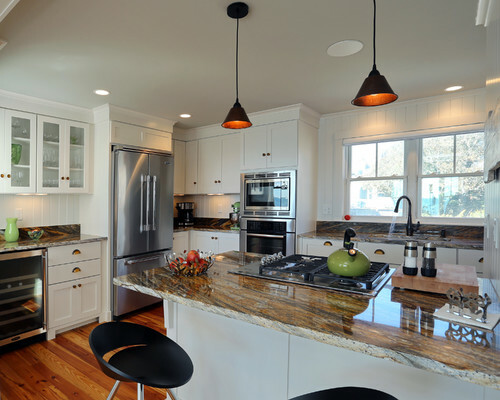 Cabinetry seems an afterthought and is constructed in beadboard when beadboard was all the budget shoppers could afford. Stainless edging on the formica countertop and linoleum floor tiles evoke depression-era aesthetic. Is that the route to the linen closet? Thanks but I'll just use my sleeping bag. 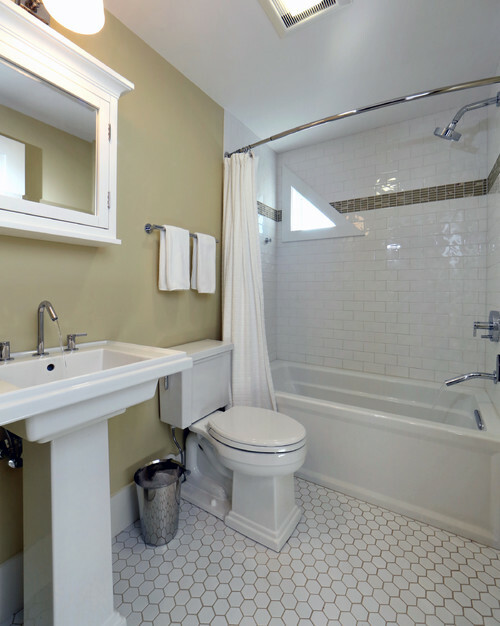 Alas, there's only so much white paint can do for a place like this. 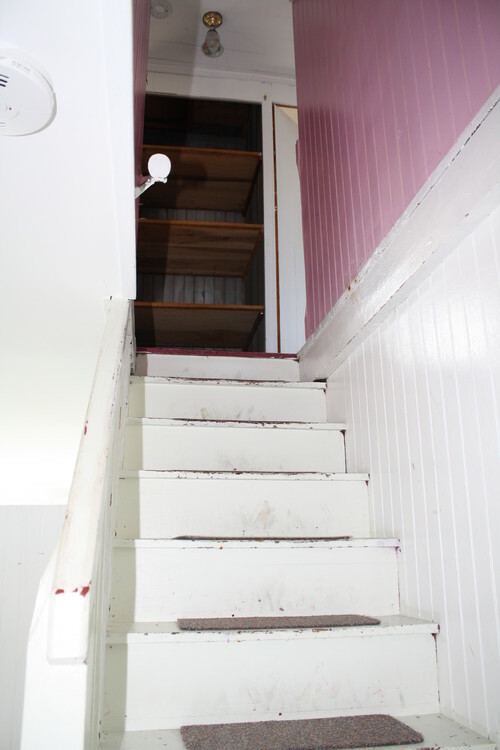 Time for a redo, but with a lot of less than 3,500 square feet and a town height limitation of 28 feet, what could be done? Plenty. Take a look. Note that the owners sacrificed the old one-car garage for more living space. I love that the new home is in scale with the neighborhood. Owners resisted the temptation to create an imposing box of a structure that would have hogged airspace. Wood-paneled walls pay homage to the cottage's rustic past. Remember, most of the surrounding homes are still original. 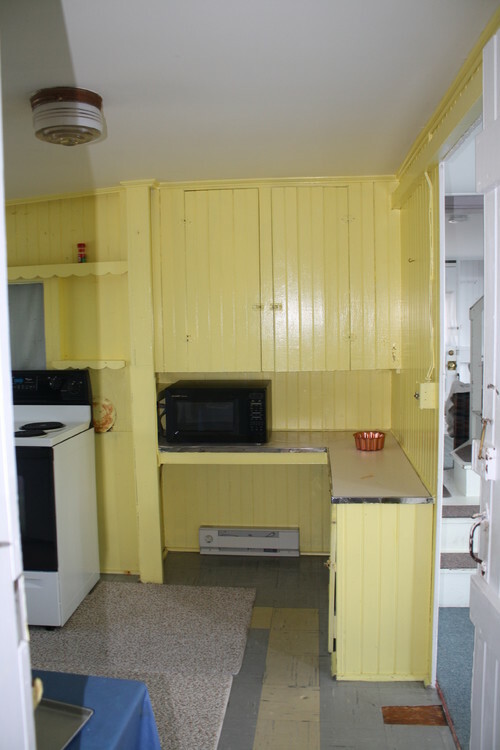 It's interesting that this compact home devotes so much space to the kitchen. It demonstrates the evolution of the way we live today. The architect said he kept ship design in mind, with clever storage solutions a major goal. 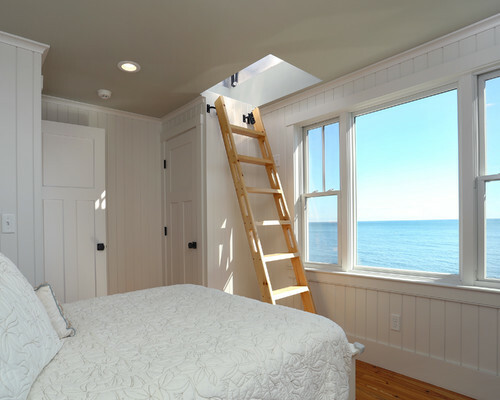 Note the drawers beneath the mattress and built-ins beneath the window. Nothing interferes with that killer view. That ladder goes to a small roof-top deck. Honestly, how does anyone ever leave this place? 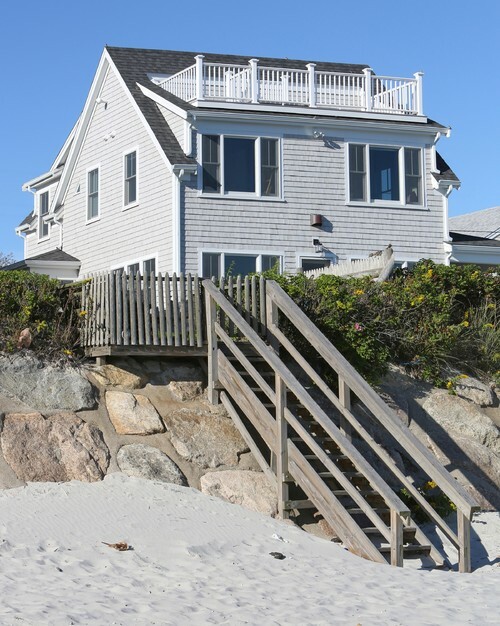 A private beach is steps away. Thanks to Houzz.com for providing the photographs and information about this project. Homes in the Campgrounds are old, uninsulated and unheated, built very close together and not for everyone. They sell for between $350,000 to $450,000--among the least expensive properties in the desirable 02646 zip code. 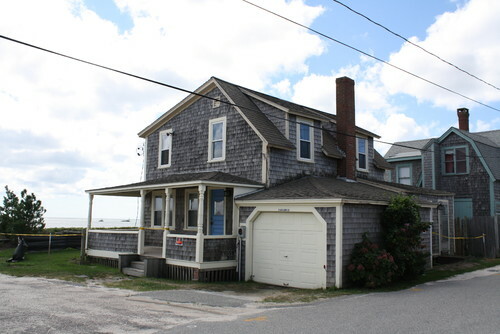 Direct ocean-front properties in the Campgrounds cost more than $1 million before improvements. Let me know if you'd like to see the current inventory in the Campgrounds. The next tear-down could be yours. Or you can just keep applying coats of paint for another 100 years.